Delicious foods all into one pie! 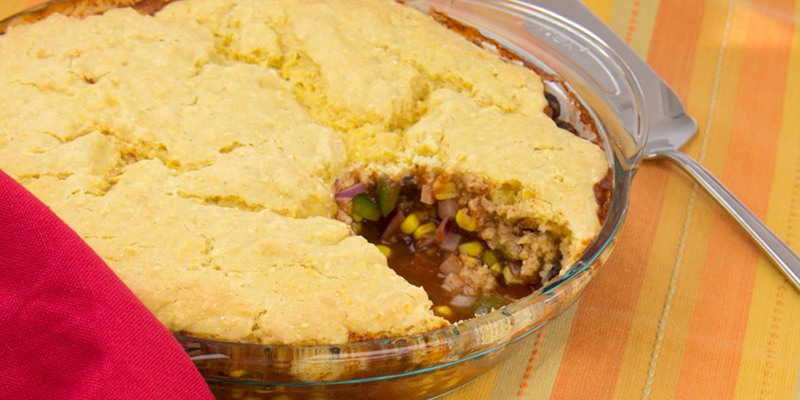 In a 10 inch pie plate or casserole dish, combine the beans, tomatoes, bell pepper, corn, onion, cilantro, and parsley. To prepare the cornbread, combine the cornmeal, flour, baking powder, and sea salt in a mixing bowl and set aside. Mix thoroughly. In a measuring cup, combine the EDENSOY, oil, vinegar and maple syrup. Let sit for 2 to 3 minutes until thick like buttermilk. Pour the EDENSOY mixture into the dry ingredients, and stir until batter is smooth. Pour the batter over the bean mixture. Bake until cake tester inserted into the cornbread topping comes out dry, about 30 minutes.